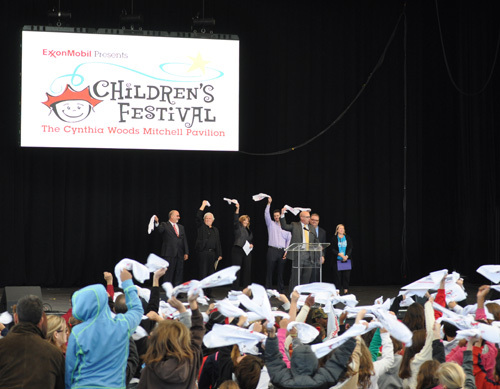 The Cynthia Woods Mitchell Pavilion is excited to team up with ExxonMobil as the presenting sponsor for the 18th Annual Children’s Festival. The Festival is an action-packed, four-day event with schooldays devoted to field trips and featuring performers who entertain and incorporate important educational lessons into their material. On Thursday, Nov. 7, The Pavilion and ExxonMobil opened up the Festival for school children with welcoming remarks. Slated to speak are Jeff Shipley, chairman of The Pavilion Board of Directors, Jerry MacDonald, president and CEO of The Pavilion, Shannon Wilson, director of marketing and education for The Pavilion and Sara Ortwein, president of ExxonMobil Upstream Research Company. Following the speakers, the media is invited to capture footage of students and ExxonMobil volunteers in action in the ExxonMobil STEM Zone featuring fun science, technology, engineering and math (STEM) activities as well as special performances on the Pepsi Main Stage and House of Blues Hospitality Tent. The ExxonMobil STEM Zone features the Children’s Museum of Houston’s exciting Magnificent Math Moments exhibit, an inflatable Big Canyon Balloon which children can explore earth sciences, and the Houston Zoo’s interactive ZooMobile experience with live animals.